These traditional sub-divisions of Greece form the basis for the modern system of regional units of Greece. However, there are important differences, with many of the smaller ancient regions not represented in the current system. Ancient Regions West Central, North and West Greece. 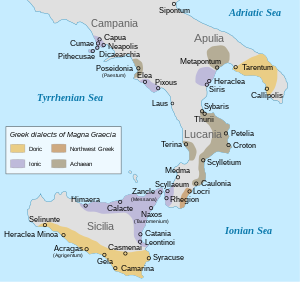 Thessaly or Thessalia was one of the traditional regions of Ancient Greece. During the Mycenaean period, Thessaly was known as Aeolia, a name that continued to be used for one of the major tribes of Greece, the Aeolians, and their dialect of Greek, Aeolic. Perrhaebia was the northernmost district of ancient Thessaly, where the tribe of Perrhaebi lived. 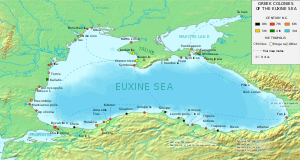 Major cities were: Pythion, Doliche, Azorus, Oloosson and Phalanna the capital. Perrhaebia was part of Macedonia between 4th and 1st centuries BC. The Molossians (Greek: Μολοσσοί, translit. Molossoi) were an ancient Greek tribal state that inhabited the region of Epirus since the Mycenaean era. On their northeast frontier, they had the Chaonians and on their southern frontier the kingdom of the Thesprotians; to their north were the Illyrians. ^ Adages III iv 1 to IV ii 100 by Desiderius Erasmus,2005,ISBN 0802036430,page 538,"Acarnania on the northern side of the Corinthian gulf was part of Epirus"
^ Errington, Malcolm. A History of Macedonia. University of California Press, 1990. ^ The Cambridge Ancient History: Vol. 6, the Fourth Century BC. ^ Lewis & Boardman 1994, pp. 430, 433–434; Wilkes 1995, p. 104; Errington 1990, p. 43; Borza 1992, pp. 62, 78, 98; Boardman & Hammond 1982, p. 284; Hammond 1998; Encyclopædia Britannica ("Epirus") 2013. ^ Hornblower, Spawforth & Eidinow 2012, p. 966: "Molossi: common name of tribes forming a tribal state (koinon) in Epirus, which originated in northern Pindus." ^ The Cambridge ancient history: The Hellenistic world, Part 2, by Frank William Walbank, 1989, ISBN 0-521-23446-8, page 461: "and Parauaea in the border country between Epirus and Macedonia"
^ "Macedonia". Encyclopædia Britannica. Encyclopædia Britannica Online. 2008. Retrieved 2008-11-03.